Sometimes people have crippling stomach pain that renders them nearly motionless. This is Crohn’s Disease, a stomach disorder that leaves patients feeling rather disheartened about participating in life. Crohn’s is basically when the intestines become inflamed. 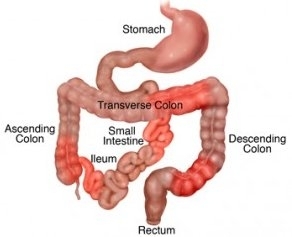 Most commonly, the end of the small intestine is affected (the ileum), and the beginning of the colon. Imagine having problems absorbing nutrients and eliminating waste. The sufferers typically lose weight due to diahrea. They have pain in their stomach that is seemingly constant. One of the tell tale signs of Crohn’s Disease is mouth sores. This might help someone who does not understand why they feel ill often. The other symptoms are fatigue, fevers, weight loss, and blood in the stool. The University of Alberta’s University Hospital Foundation reports that Alberta has the highest rate of Crohn’s Disease not just in Canada, but in the world as well . Thankfully, there are new treatments coming out. CTV news reports that a new drug called Stelara has hit the market. They mention a success story, but also that the cost of the medication is still high . Crohn’s and Colitis Canada also mentions a new app that can help patients keep track of symptoms in between doctor’s visits. Careful monitoring of this disease can help the doctor stay up to date on what is happening for the patient, and if any of the treatments are helping. Qu Biologics has opened clinical trial sites for new treatments for Crohn’s disease in Edmonton. For more information, a patient can visit their website or call their clinic in Vancouver at (604) 734-1450. This clinic offers Site Specific Immunomodulators (SSIs) that aim to modulate the immune response in the intestines. In this case, this might reduce the irritation and swelling in that area for Crohn’s sufferers. The IBD Clinic run by University of Alberta (Edmonton) gives the patient a team of specialists. The patient gets access to gastroenterologists, a nurse specializing in IBD, and a dietician. The patient’s team consults with other health care specialists and surgeons to ensure the person is receiving top notch care. A person’s physician will need to fill out a form located here in order to refer the patient to this clinic. There are new treatments and specialized clinics to help those who have Crohn’s. It might be difficult to talk about symptoms, but it is helpful to know that there are plans that can get patients back to functioning. And that is essentially what all Crohn’s sufferers desire - to not have to think about their digestion all day. Make sure to encourage people who suffer from digestive problems to document their symptoms and visit the doctor. Their problem is more common, especially in Alberta, than they might think.